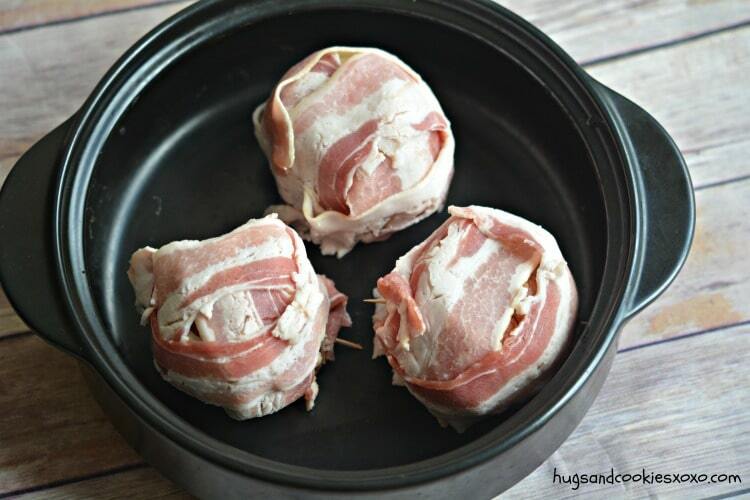 Wrap each "bomb" with 3 slices bacon and secure with toothpicks. Wow!!! 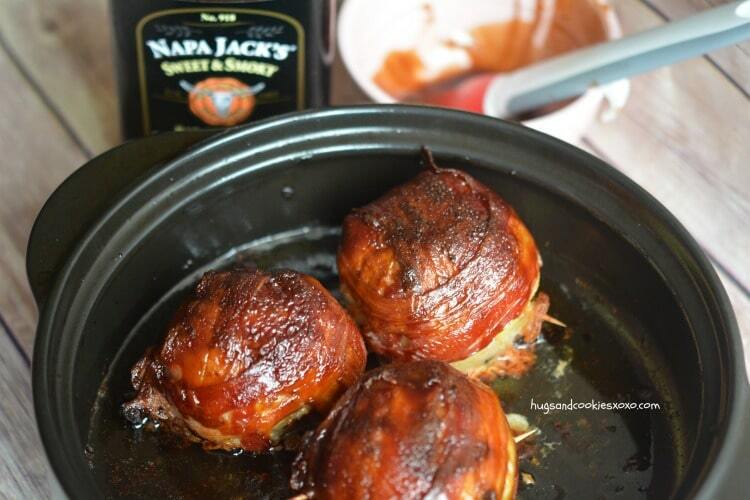 I’m sure I don’t need 3 strips of bacon or that much beef, but I have to try these. And it just so happens I have 3 strips of bacon in the fridge right now! You know Oprah says if you have bacon in your fridge you are not seriously dieting! LoL! These sound amazing and would be a real crowd pleaser. I cook for one and I must attempt this. Pinning and planning dinner right now! Hope u love it-we sure did!! Add cheese cube in the middle of the ground meat, that’s the missing ingredient!! Actually Oprah is wrong I eat bacon every morning and lost 41 pounds in 4 months! Keto diet is awesome!!!! These sound outstanding and I just bought some sweet Vidalia onions! I think I will put them in my small roaster with the tray to let the grease drip though. 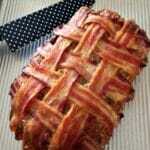 I use that for my meatloaf that I cover with bacon. 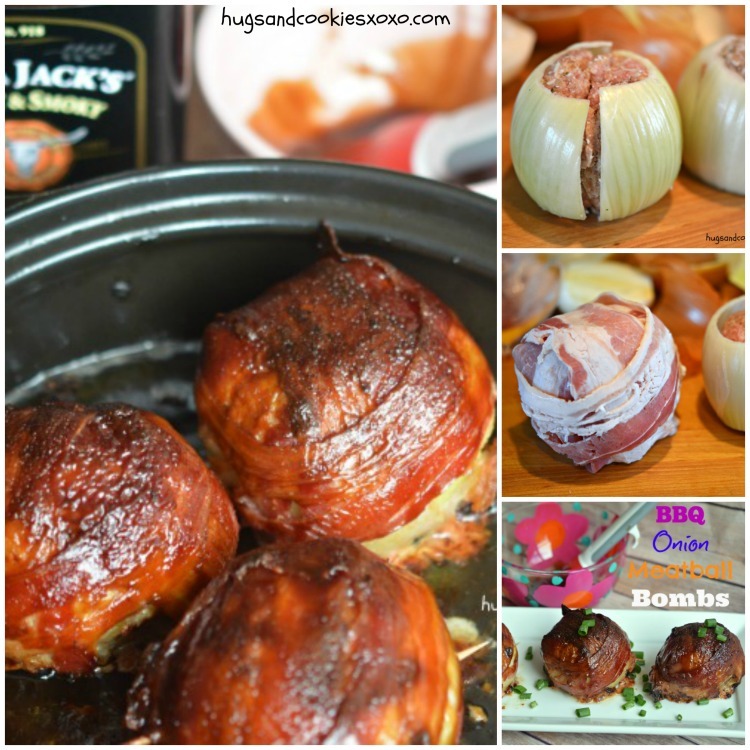 How about onion bomb apps for a party? 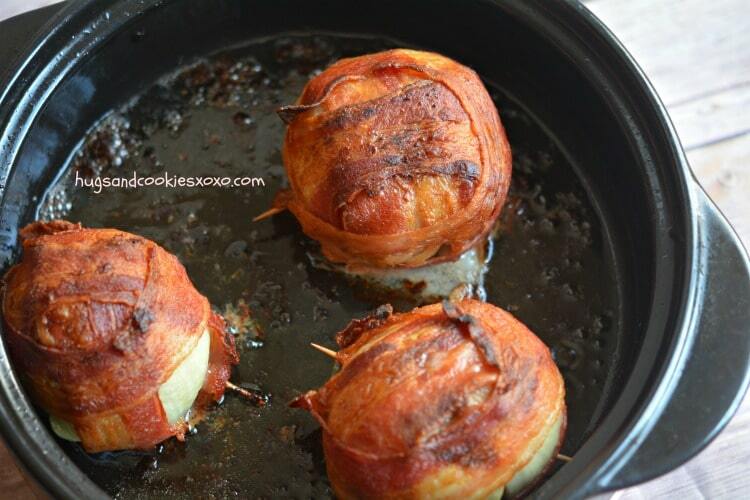 Just use smaller onions and one piece of bacon? You have my creative juices flowing….fill with ground chicken or turkey with ginger and red pepper seasoning and brush with teriyaki! Don’t you just love cooking new food! I know this answer is late..but the appetizer idea if fabulous. 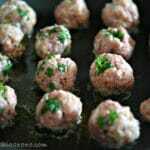 Use pearl type onions (you can get them by the bag in the frozen foods), use a melon baller to make the tiny meatball part. 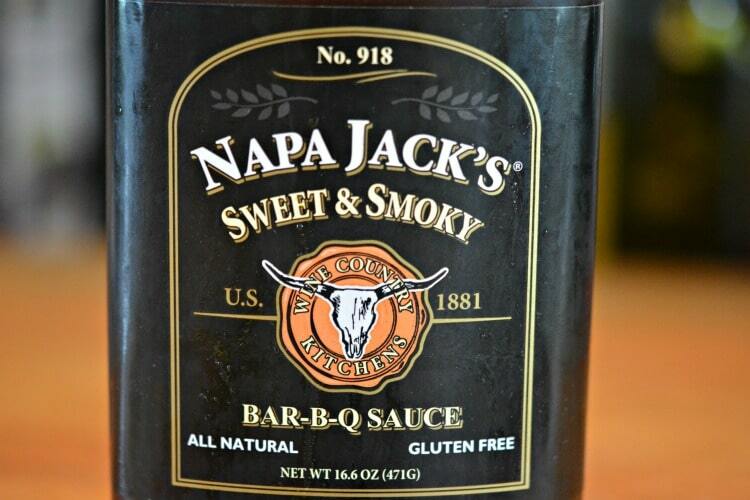 Brush with barbecue sauce or pepper jelly or anything that was sweet/spicy. What a great idea. We used to do something like this, wrapped in foil, on the grill in the summer too. 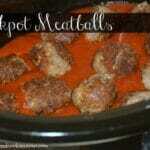 l plan on trying this great meatball recipe in my Actifry. Thks for sharing as l just received my Actifry as a gift, & l’m really green to its uses. It’s obvious why they don’t include nutritional values on these recipes. BUT, it did say it’s filed under ….. DINNER, GLUTEN FREE, MEAT BALLS, MEATLOAF! GLUTEN FREE is ONLY of value to people with CILIA. It has become a big fad but going Gluten Free has absolutely NO benefit to anyone else. Gluten sensitivity is real if you have certain auto immune issues. I have a daughter who does have Celiac Disease and I have a gluten intolerance not just a fad. I try to include some gluten free options as my hubby has celiac. I’m impressed by your level of passion regarding other people’s eating habits. Do you apply this much effort into productive and polite things as well? While you’re obviously welcome to your own opinion (personally, I keep mine quiet if I find a recipe I dislike or disagree with on someone else’s, blog. ), there are thousands (millions?) of us in the world who see irrefutable and positive changes in our bodies and overall health by living on a GF/AIP/Paleo/Primal/etc. diet on a daily basis. Wheat doesn’t bother you? Knock yourself out. Eat all the bread you’d like. 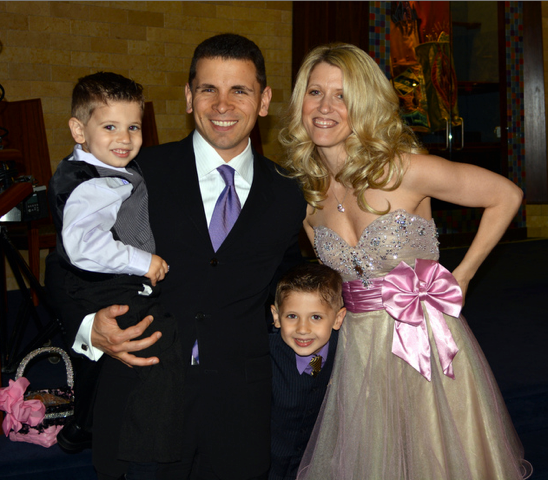 But my family has lost overall fat and gained muscle, has lowered cholesterol and blood sugar levels, has fewer upset stomachs and ADHD symptoms, etc., since we’ve done our best to eliminate grains from our diet. Our nails are stronger, our hair is shinier and less prone to breakage… We’re living the positive results and have no desire to go back to the old ways. Do we cheat here and there? Sure. Without celiac in our home, it’s not as vital that we always follow the right eating plan. But we do as much as possible and truly feel the repercussions when we break down and load up on traditional bread or too much cheese. I, for one, want to try this with grass-fed breakfast sausage for quick before-school breakfasts with some fruit on the side! Or a small pepper instead of the onion. Or lining the pepper with onions the next time I stuff peppers! You’re right, Danielle! This recipe has endless possibilities! Thanks for posting it! I can’t wait to give it a try for my family! 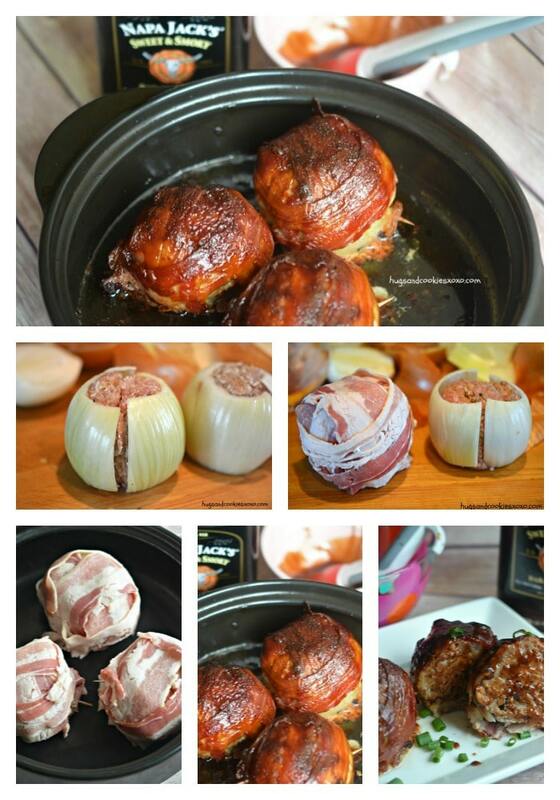 I’m going to try this in my Actifry, looks so yummy, l know my husband will love it. Gluten free is a VERY important role in anyone with Autism also. Made these tonight…..either the baking instructions are incorrect or the picture was photoshopped. After 60 minutes of baking time the bacon still wasn’t crisped and the meat was a lovely shade of grey. Not photoshopped LOL. That is the time that worked for me, however, I used a Rockcrok pan so maybe your pan needed a longer cooking time. Hope you cooked it longer so you could enjoy them! Can you cook and then freeze these for prep in advance for a party? I cannot WAIT to try these. 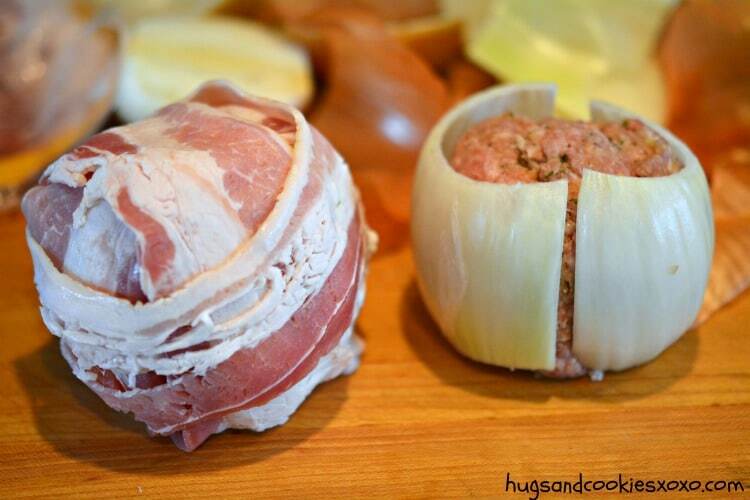 I’m thinking of putting strips of pepper jack or monterey jack right down the center of that meatball lol. I will try them as is first before adding my flair. 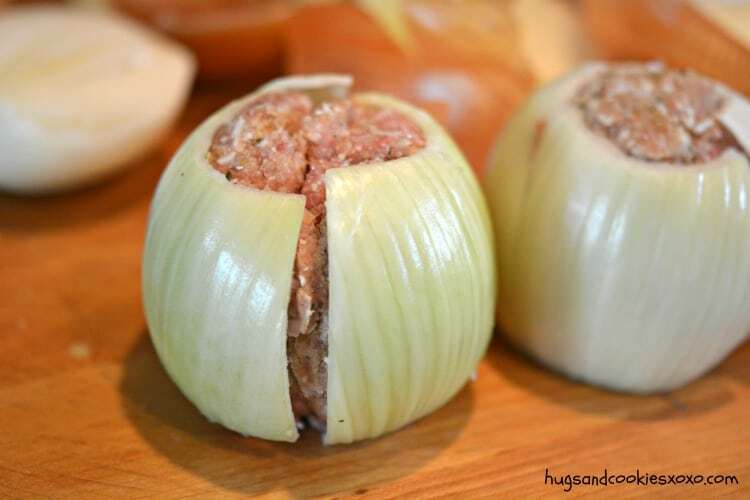 I love the idea of the onion and may cut out the bacon and tweak with ground turkey mixed with a x-lean beef since we are trying to cut back but I’m thinking a fully stuffed onion would be awesome. What do you think about putting these on the grill? mmmmmm, sounds great! Let me know if u try it! How many does it make? and can you cook on the BBQ? Definitely I will try this one! So unique! Thanks for sharing your creative ideas! I’ve made these several times now and they are delicious! 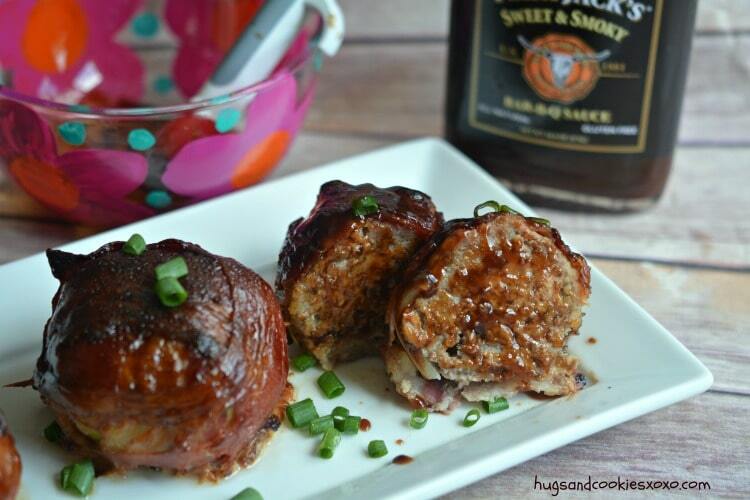 They were instantly a hit with the hubby and after a mild tweak for my daughter (different BBQ sauce) she loves them too! Thank you! Now to go make these up and pop them into the Crockpot for the first time. It’s too dang hot to run the oven! Great idea-how’d they come out? I was wondering how they come out in the crockpot too. . did you get a response on that? How did it work in the crockpot? 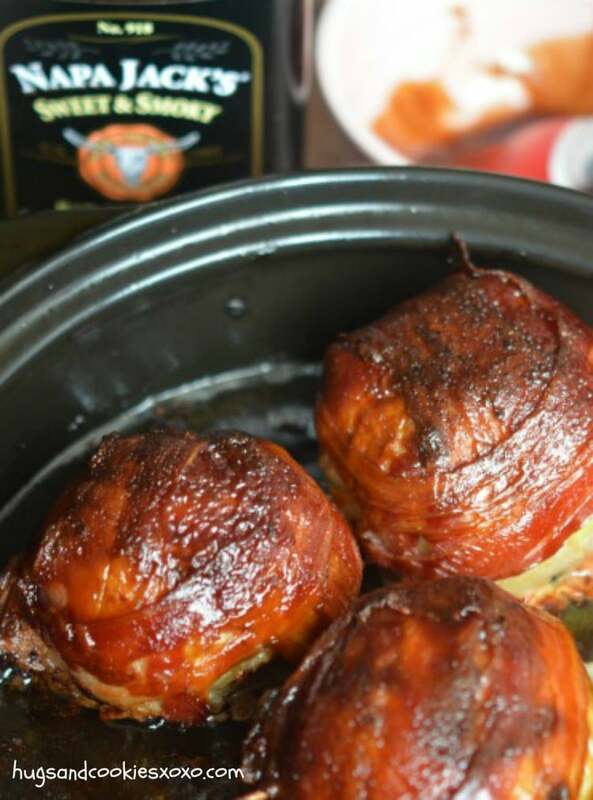 Can you make these in the crock pot? These turned out good! And I think it’s great to post gluten free recipes, it helps people with celiac who have limited options, and it doesn’t hurt the rest of us either way. Oh yum, I think I’ll give these a try this week! Maybe put a rack in the pan for the grease to drip down so the bottom isn’t soggy and run the broiler at the end to crisp it all up. Looks tasty! Trying these for a very picky hubby and brother in law tonight! They will eat nothing but meat and potatoes and it gets so boring for me! That is fabulous!!!!! woo hoo! Absolutely delicious! Easy to make and everyone loved them! I put mine on a baking rack to keep them out of the bacon grease while they cooked! 5 stars! First of all – THANK YOU! This recipe looks delicious and will be tried this weekend here at our house. Enjoy those two gorgeous little men of yours; mine are grown (27 and 28, with a daughter who is 30), so we are now enjoying our grands who look about the same ages as your handsome little dudes, and I think they will go APE over these! It’s also really nice to come across recipes that use mostly pantry ingredients. I live in a wee little (less than 800 ppl) remote town in the Canadian Arctic, so both of our little grocery stores are no bigger than your average gas station convenience store. This means that we get no fresh herbs (EVER!) and our produce sections are about as big as a large sofa each. 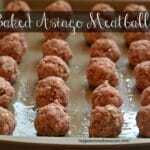 These meatball bombs will appeal to everyone in the family, but I am already picturing my five year old grandson’s face when I tell him we are making “bombs” for dinner. I’m pretty sure that I will owe you more thanks at that point; I mean, who doesn’t like being crowned the coolest Grandma? This recipe is also something that they will easily be able to be very hands-on in the making, which is AWESOME! We love to cook, and they love to cook with us – win/win! I just found your site, but this is one new subscriber who can’t wait to delve through your archives! Thanks again! What a wonderful message to read-thank u!!!!!!! I made these tonight for my husband and my son and both absolutely loved it. My husband is on a Keto diet and these worked really well. I only added a tbs of breadcrumbs and a tsp of bbq sauce. Thank you so much for the recipe, this is a new favorite. I will them soon ! Hi Danielle, love your recipe! Can’t wait to surprise my husband with it. Thanks for sharing your recipe. Also looking forward to reading the comments for tips. Hope he enjoys his surprise! 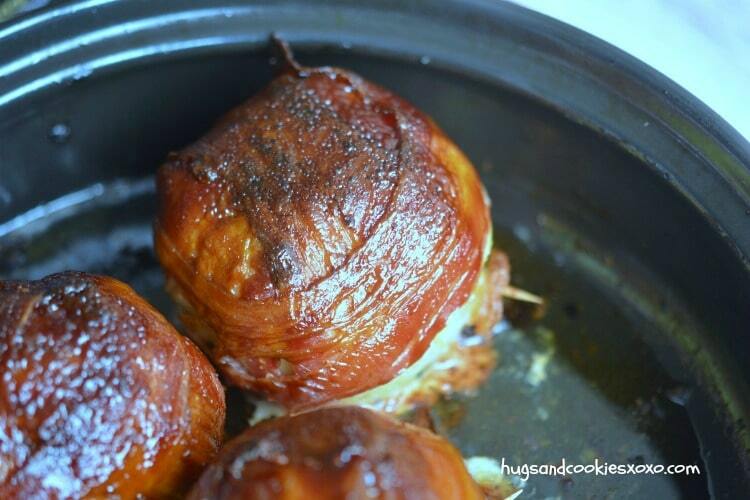 Have you ever done these in a crock pot and what would be time and temperature? I haven’t tried it. Let me know if u do! These look incredible and so easy to make! My sons love their meat and are going through a bit of a bacon obsession at the moment so I just know this recipe will go down well. Will be printing and trying this at the weekend. Thank you! Did you ever find out the crock pot cooking instructions? I want to try these but I would like to cook them in my crock pot. They look so yummy! hahaha hope u enjoyed them!!!! These look delicious. Im going to do them on my smoker instead of the oven (as its summer) – Can’t wait to serve them at my next cookout. 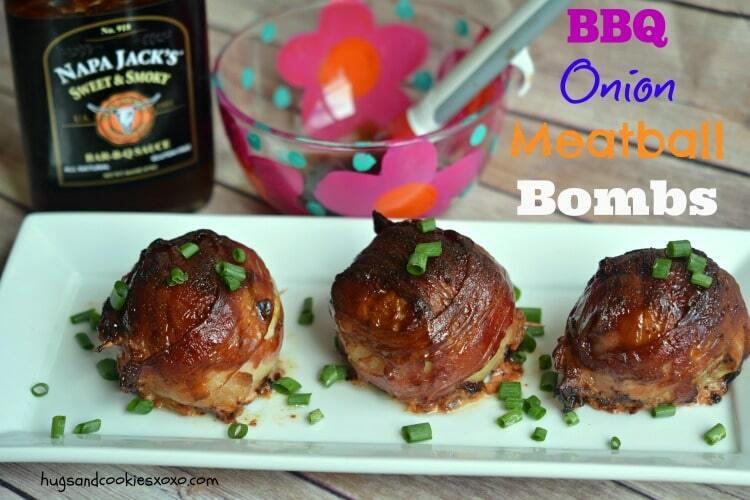 Can’t wait to make them… I have guests this weekend so I am going to try smaller ones, more like an appetizer. Thank you for the recipe. Anyone ever done this in a pressure cooker. If so how long? I made these meatballs for dinner and everyone loved it and asked for more. Thanks for sharing. I would definitely have to make them again. This seems to be awesome with taste. Can I add more chili to make it become spicy food? Thanks. Is it a good idea to grill these on a digital smoker? A very unique recipe for BBQ indeed. Loved making it and it turned out delicious. Will definitely make it again. Thank you.